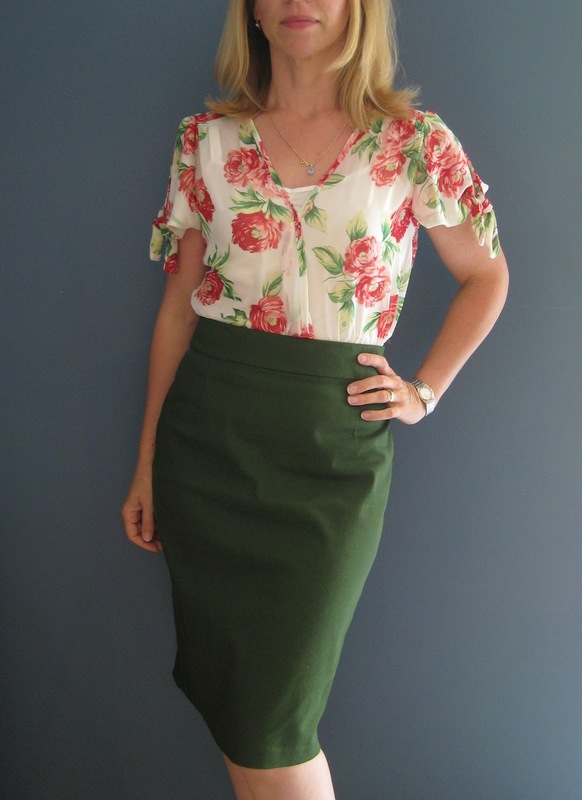 I’ve been eying off the Burda Jenny Skirt for a while ever since I did a Google Image Search of this pattern and was struck on how lovely it looks on everyone. I came into a fabric stash bonanza last week when my husband went to Vietnam on a business trip and went out of his way to go to the fabric district/street and went fabric shopping for me. Having no idea about fabric he sent me a few bewildered text messages while I frantically tried to point him in the right direction via telepathy. Anyhow, he managed to do an excellent job. I have enough fabric to see me out for a few projects. Love that man, I really do. One of the pieces he bought was a length of what feels like a stretch twill/drill in a dark olive green/khaki. Not sure of fabric content. It feels nice, and a natural fibre not synthetic. I printed off my Jenny pattern and set to work. I had just enough to make the skirt but not cut the waistband on the bias. 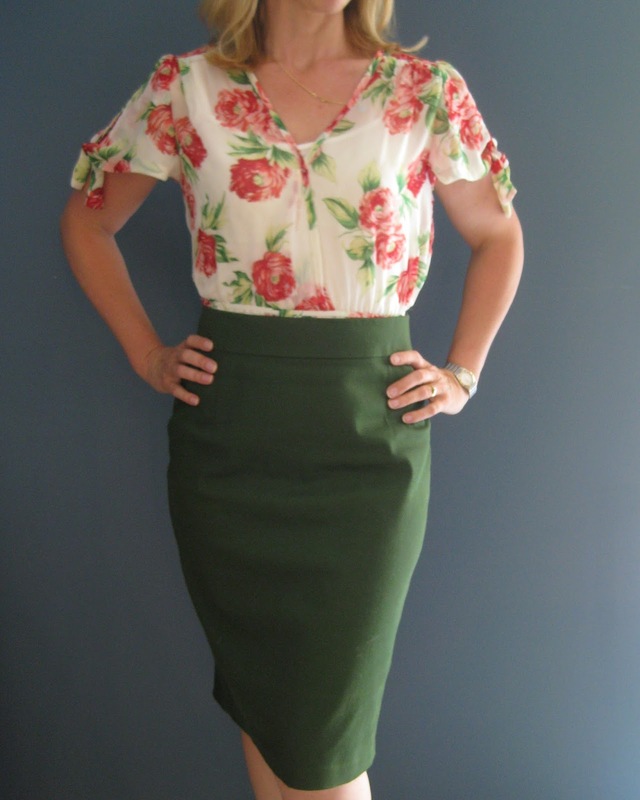 – I tapered the skirt in a little from hip to hem, about an extra 1/2″ for a total 2 inches overall. more fitted pencil skirt. I also halved the waistband width. – I only cut 1 of the waistband pieces and then folded it over to make it half the width as I didn’t want the really high waistband look. The top was siting out from the body a little too much so I pressed the fold so I had a clear crease and then stitched some cotton tape next to the fold mark, pulling the tape as I stitched and easing the waistband in as I went. This worked so nicely: it stabilised the waistband beautifully and also brought it in snugly against my body for exactly the fitted look I was after. Will do this again. – I added a back vent as per Sunni’s tutorial, a much classier look. Sunni has also done a pencil skirt sewalong which is brilliant. Back vent and hem finish. I used some leftover silk bias strips to finish the waistband so I wouldn’t have bulk from turning the seam under and also to finish the vent seams and hemline, which just looks pretty on the inside. I didn’t line it as I wanted to fit it closely and take advantage of its natural stretch unhindered by lining. It is a heavy weight fabric so sits well without lining although I may go back and add some later (maybe cut on the bias so it has stretch as well??). This skirt has my best fitting waistband yet. This will definitely be my TNT pencil pattern. I plan to make a few versions as I really love this look, plus its such a great quick and easy project to knock out, which was a relief after the many hours I spent fluffing about with my Juniper pants. First time using binding to finish waistband facing instead of turning under. I’m wearing it here with my new Simplicity 1872 blouse.